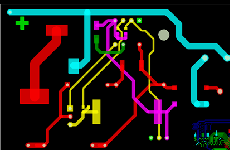 With this FloWare module for OrCAD and Allegro PCB Editor you can colorize different nets. This is helpful, when you have high voltages on the PCB and you have to ensure a certain net spacing between several net classes for isolation. When coloring each voltage range in one color, you can visually review your design rules and identify missing or wrong design rule settings. This feature helps you when reviewing a design or need to document the spacing.